Around The World in 24 Hours – Making sense of an interconnected world. Together. How comfortable would you be if your high school principal carried a concealed weapon? What are the issues surrounding health care in the United States? How do schools differ between Burnaby and Passaic Valley in New Jersey? These are the questions which framed the discussion between Ms. K. Elliott’s Social Justice 12 class at Alpha Secondary and Ms. K. Menake’s American Contemporary Issues Through Videoconferencing class on Tuesday, May 14th. 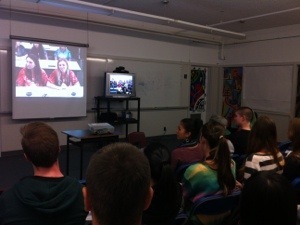 The opportunity was part of the annual event which Burnaby participates in called, “The 24 Hours Around the World Videoconference”. The host students, from Passaic Valley High School which is 15 miles from New York City, organize one discussion with a different country every hour for 24 hours. The discussion begins wih an introduction to each other’s schools and community and then moves on to current issues. It turns out that in February 2013 the regional board for Passaic Valley voted to allow the PVHS principal to wear a concealed handgun. The principal is a former police officer. Students in PVHS were extremely supportive if this move, citing the reason that they felt safer. Both American and Canadian students compared this to Canada where guns are harder to access, where there are fewer such instances and where Canadian students feel safe without staff carrying guns. All in all it turned out to be a fascinating discussion with our closest international neighbours and allies in the United States. Thank you to Ms. K. Elliott for the excellent preparation of her students, and for the presence of Alpha’s new principal Ms. P. Hari.